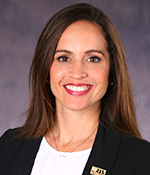 Danielle Barreras is a third generation Miami native. She earned a bachelor’s degree in elementary education and American studies from the University of Miami. She also holds Florida Teaching Certificates in K-12 education with a focus on reading and language arts, along with endorsements in ESOL and gifted education, and was recognized in the Top 200 Reading Teachers in the state of Florida. After UM, Ms. Barreras spent a year abroad with an international group of young professionals organizing community relief missions throughout Italy. The experience propelled her into a decade of teaching, creating and managing extracurricular programs for children, guiding families through the county education system and hosting professional development sessions for educators across the Miami-Dade County Public School system. Since then, she's worked at Florida International University, where she developed educational initiatives and managed learning and teaching-related activities for both faculty and students. With encouragement from friends and family, she also ran The Gold-Diggers, a nonprofit that gives professional women a platform to write and produce an annual Broadway-style musical benefiting the Leukemia & Lymphoma Society and Meals on Wheels Program of South Florida. In her free time, Ms. Barreras loves camping, yoga and spending time with her husband and two children. She passionately believes that society as a whole is responsible for all children, and that through our collective efforts, we have the opportunity to raise all children into compassionate, mindful citizens.